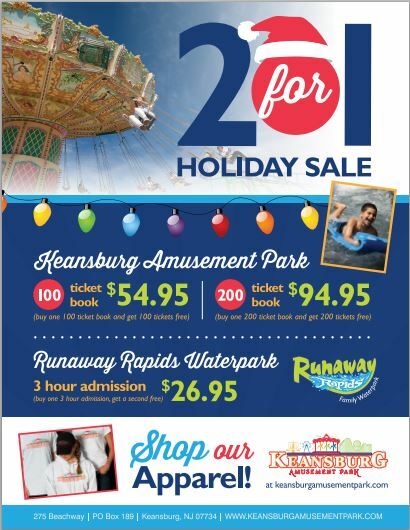 Double your fun with Keansburg Amusement Park and Runaway Rapids’s 2 for 1 holiday sale! Running now through December 15th, 2014, for every ticket you purchase you will receive one free. Double your fun with Keansburg Amusement Park and Runaway Rapids’s 2 for 1 holiday sale! Running now through December 15th, 2014, for every ticket you purchase you will receive one free. Purchase a 200 ticket book for $94.95 and receive 200 tickets, 100 ticket book for $54.95 and receive 100 tickets free and purchase a 3 hour Runaway Rapids ticket for $26.95 and receive a Runaway Rapids 3 hour pass. Keansburg Amusement Park and Runaway Rapids tickets make the perfect gift because they never expire. To purchase your 2 for 1 Keansburg Amusement Park or Runaway Rapids tickets visit www.keansburgamusementpark.com. Read our review of the Runaway Rapids water park! Keansburg Amusements and Runaway Rapids continues its 110 year tradition of offering family fun on the Jersey Shore. Park attractions include rides, games, arcades, go karts, fishing pier, and classic Jersey Boardwalk food. Visit Keansburg Amusement Park’s website at www.keansburgamusementpark.com for more information on admission, attractions, birthday parties and group outings.